Yelp / Alison MEgg yolks make it so creamy. Few understand what differentiates frozen custard from ice cream, which is why we’ve put together this handy guide. Custard must contain egg yolks. Much like ice cream, frozen custard is made from cream, milk, and sugar. Both frozen treats must, by law, have at least 10% milk fat. However, custard has a further requirement that ice cream does not: it must also contain at least 1.4% pasteurised egg yolk. Egg yolk is what gives custard its signature creamy texture. Flickr / Eugene KimA frozen custard machine. There’s not much overrun in custard. The air that’s beaten into frozen custard and ice cream is known as overrun. 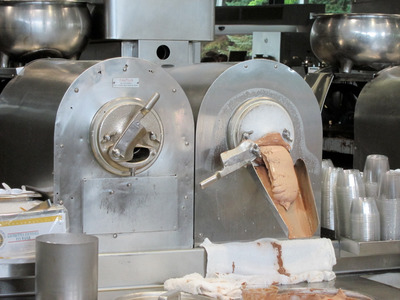 Custard machines are designed to push custard into a waiting chamber before it’s served, but because it is held in this chamber, custard doesn’t have a lot of air whipped into it. 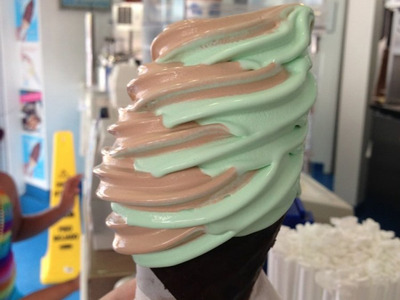 Frozen custard usually only has around 20 to 25% overrun. Ice cream, by comparison, can have up to 50% overrun.